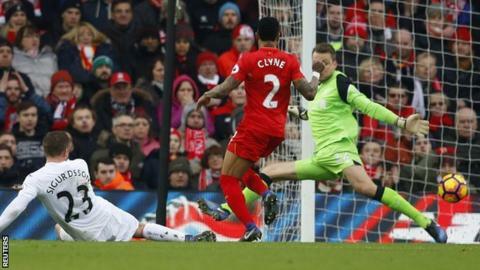 Swansea lifted themselves off the bottom of the Premier League table and dealt a huge blow to Liverpool's title hopes with a thrilling win at Anfield. Gylfi Sigurdsson scored from close range with 16 minutes left to give Paul Clement his first win as Swans boss and the club their first away league victory over the Reds. Roberto Firmino had struck twice to draw the hosts level after Fernando Llorente's two goals in four minutes after the break. The defeat leaves Liverpool seven points behind leaders Chelsea, who now have a game in hand, at home against Hull on Sunday. The Tigers are one of three teams, along with Sunderland and Crystal Palace, leapfrogged by Swansea, who move up to 17th after only their second win in eight league games. In the wake of last weekend's demoralising 4-0 defeat by Arsenal, Clement said Swansea would be "naive" to ignore the possibility of Premier League relegation this season. On the evidence of their performance at Anfield, it would be equally naive of anyone to write them off. In the space of seven days they have gone from a side who collapsed at the first setback to one capable of rallying under extreme pressure. Their first-half defensive display - which saw them restrict Liverpool to a couple of half-chances - belied their status as the club with the division's most porous defence. Their second-half performance was clinical, epitomised by Llorente's two strikes - a close-range finish following Federico Fernandez's header from a corner, followed by a header from Tom Carroll's cross - and Sigurdsson's decisive, well-placed finish. These were their only three efforts on target. It was also gutsy. They had to dig very deep against a side who, before Saturday, were unbeaten in the league in over a year at home and who had scored 26 goals in their previous nine league games. In the programme for this match, Liverpool boss Jurgen Klopp described October's encounter with Swansea in Wales - a 2-1 win sealed by a late James Milner penalty - as "one of the toughest we have had all season." The German may feel the need to revise that after Saturday's game. Despite having Philippe Coutinho back in the side - and ending the game with Divock Origi and Daniel Sturridge on the pitch - the Reds were short of attacking invention and strength in the absence of Sadio Mane, who is at the Africa Cup of Nations with Senegal. Their failure to move the ball quickly enough in the first half meant they did not properly test Swansea's packed defence. And while Firmino scored his first goals in six games - the first a header from Milner's cross, the second a fierce finish after he had chested down Georginio Wijnaldum's delivery - a total of five shots on target and an Adam Lallana deflected effort against the bar is scant product from nearly 75% possession. With this result coming after successive away draws at Sunderland and Manchester United, the Reds are in danger of allowing a title challenge to slip away before February has even begun. Their next game, at home to the league leaders, is now surely a must win. He may not be as mobile as he once was, but Llorente still knows where the goal is. This was his third Premier League double of the season. Liverpool manager Jurgen Klopp: "It's hard to accept. In the first half we created four or five chances which we didn't take. "The start of the second half we were poor and then we played brilliantly and scored two. Then we were a bit passive and one player was alone in our box, which is completely senseless. "The most disappointing moment was the third goal and I can't explain it as we had so many chances to challenge. "It's really difficult to accept at this moment. It is fair Swansea won, no - but was it deserved, yes." Swansea manager Paul Clement: "We frustrated Liverpool and defended really well. We showed great togetherness and it was a massive team effort. "At half-time I told the players we would get at least one chance, but to get three was unbelievable. "It's very important for the confidence of the side that we can come to a big team and get a result. We need to work hard on the training pitch and make sure we get another result in 10 days' time." Liverpool's unbeaten Premier League run at Anfield has ended after 17 matches (11 wins, six draws). Firmino has scored three goals in his past two Premier League games against Swansea. Llorente has now scored eight Premier League goals but his first two away from home. Liverpool conceded three goals at Anfield in a league game for only the second time under Klopp. The Reds are the first Premier League team score 50 goals this season, while Swansea are the first to concede 50 (both now on 51). Swansea have won back-to-back away league games in the same season for the first time since May 2015. Liverpool will attempt to overturn a 1-0 deficit when they host Southampton in the EFL Cup semi-final second leg on Wednesday (kick-off 20:00 GMT). The Reds then welcome Wolves to Anfield in the FA Cup fourth round on 28 January (12:30), before another home game - the big one in the Premier League against Chelsea - at 20:00 on 31 January. Swansea's involvement in the FA Cup ended in the last round so their next game is at home against Southampton in the Premier League on 31 January (19:45). Match ends, Liverpool 2, Swansea City 3. Second Half ends, Liverpool 2, Swansea City 3. Substitution, Liverpool. Joel Matip replaces Georginio Wijnaldum. Substitution, Swansea City. Jay Fulton replaces Leroy Fer because of an injury. Offside, Liverpool. Dejan Lovren tries a through ball, but Divock Origi is caught offside. Delay in match Leroy Fer (Swansea City) because of an injury. Foul by Tom Carroll (Swansea City). Leroy Fer (Swansea City) is shown the yellow card. Leroy Fer (Swansea City) has gone down, but that's a dive. Attempt blocked. Roberto Firmino (Liverpool) right footed shot from outside the box is blocked. Assisted by Divock Origi with a headed pass. Attempt missed. Gylfi Sigurdsson (Swansea City) right footed shot from outside the box is close, but misses to the right from a direct free kick. Leroy Fer (Swansea City) wins a free kick in the attacking half. Attempt missed. Adam Lallana (Liverpool) header from the centre of the box is too high. Assisted by Daniel Sturridge. Substitution, Swansea City. Borja Bastón replaces Fernando Llorente. Attempt missed. Roberto Firmino (Liverpool) left footed shot from outside the box is close, but misses to the right. Corner, Liverpool. Conceded by Lukasz Fabianski. Attempt saved. Dejan Lovren (Liverpool) left footed shot from outside the box is saved in the top centre of the goal. Assisted by James Milner. Substitution, Swansea City. Angel Rangel replaces Martin Olsson. Attempt saved. Divock Origi (Liverpool) right footed shot from the centre of the box is saved in the centre of the goal. Assisted by Dejan Lovren with a headed pass. Corner, Liverpool. Conceded by Alfie Mawson. Attempt blocked. Nathaniel Clyne (Liverpool) right footed shot from outside the box is blocked. Goal! Liverpool 2, Swansea City 3. Gylfi Sigurdsson (Swansea City) left footed shot from the centre of the box to the bottom right corner. Attempt blocked. James Milner (Liverpool) right footed shot from outside the box is blocked. Assisted by Dejan Lovren. Substitution, Liverpool. Divock Origi replaces Emre Can. Goal! Liverpool 2, Swansea City 2. Roberto Firmino (Liverpool) left footed shot from the centre of the box to the bottom left corner. Assisted by Georginio Wijnaldum with a cross. Corner, Liverpool. Conceded by Kyle Naughton. Jack Cork (Swansea City) wins a free kick in the defensive half. Attempt missed. Alfie Mawson (Swansea City) header from the centre of the box is close, but misses to the left. Assisted by Gylfi Sigurdsson with a cross following a corner. Corner, Swansea City. Conceded by James Milner. Delay in match Fernando Llorente (Swansea City) because of an injury.